Every Sunday I eat delicious food and watch Project Runway America with the funnest gay couple ever. I thought my Sunday nights could not get any better until we invited a pretty fly for a straight guy along. Turns out straight guys have girlfriends who work in fashion retail and bring along their nail varnish collection so us girls can paint our nails when the boys inevitably talk about boring boy stuff - AMAZING! 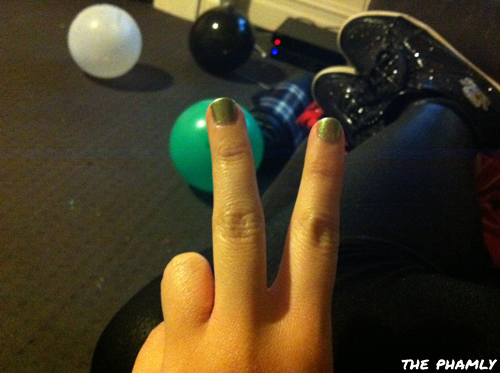 I got to try the new limited edition Chanel Le Vernis in Peridot 531. 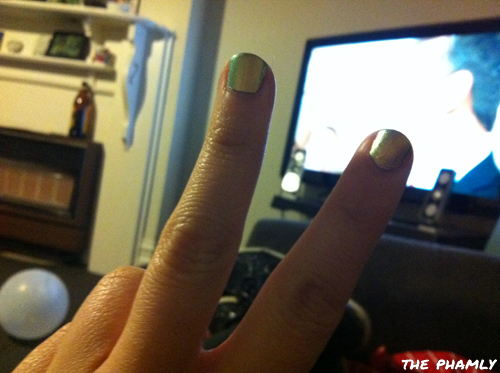 This amazing metallic nail varnish looks gold at certain angles and green in others. It is perfect for the indecisive fashionista or the quickly bored. It is also easy to paint on and quick to dry for those with short sitting-still spans. Love, love, love it. Except for the part where I have to add it onto a long list of things I want to buy once I get a job in Brisbane. Sigh. UPDATE 05/04/12: Little Sissy Pham bought me this Chanel nail varnish! Best sister ever! I should blog about other things I secretly want her to buy for me... like a house with an indoor pool and a cat door.